Neely Coble Company has carried the Isuzu product since its introduction to the United States in 1984 – it’s safe to say we’re experienced with all the benefits and features the Isuzu landscaper has to offer! With a wide variety of work ready trucks stocked at all times, we can assist with any assortment of customization and body applications! Attached to either a single cab or crew cab 12,000 lb. 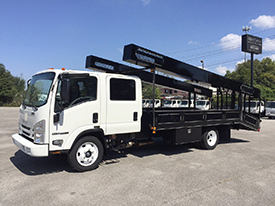 or 14,500 GVWR Isuzu cab forward truck, the 19-ft. custom Irrigation body is remarkable piece of equipment that would add value to any landscaper’s inventory!